When I run my mind is all over the place. I think about my past, what I have to do later, what's bothering me, who's around me, what I want to eat afterwards, possible funny article ideas, I create really crazy and elaborate day dreams that can span for miles and miles and miles -- the list goes on and on! I love running because it feels like an active way to meditate (if that makes sense). I never know if my brain is going to shut off or go into overdrive but by the end of a run it's always where it needs to be. But the way I listen when I run is very different to the way I listen when I'm doing Yoga. 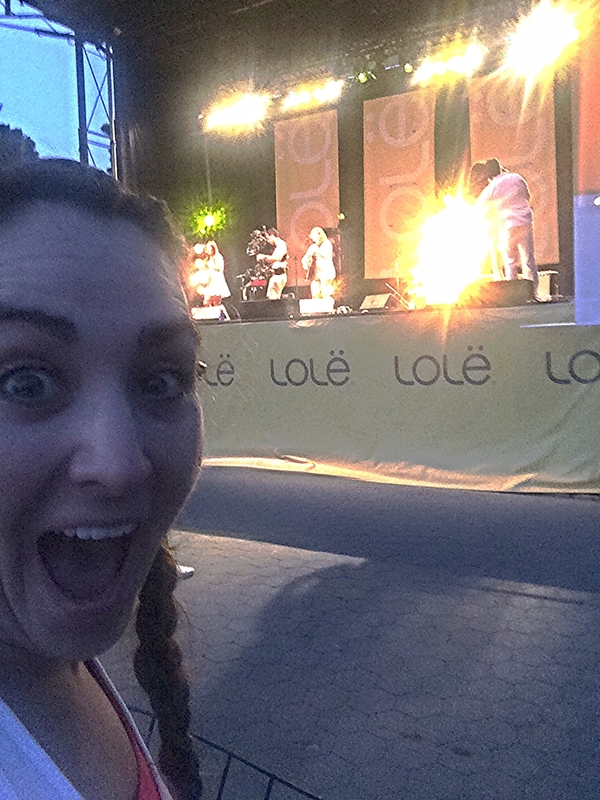 Last night I got to attend Lole's White Tour. What made it so special? I was one of 10,000 people gathered on Central Park's Great Lawn for the event. Here's an aerial shot to help you get a feel of how many people shared this experience. Photo courtesy Lole White Tour. I had a really long day yesterday, a 19 hour long day to be exact. It's been a pretty stressful Summer (all good stress, just busy! I can't complain about being busy!) but my day started at 4:30am. I'm supposed to be on rest from running but after a particularly stressful week, I needed to run. I set my alarm so I could make the pilgrimage to the Upper East Side to show up for PR day with November Project. I'm glad I did because after a fast (for me) and pain free 3 miles, I was feeling a lot more grounded and ready to tackle my day. The day flew by and before I knew it I was running out the door to go back uptown for the Lole White Tour. I was running late and got to the event right before it began (thank you rush hour subway traffic) but I was escorted to my mat and I sat down and tried to calm my nerves and get my bearings. Then Ingrid Michaelson started singing Keep Breathing and I felt tears pool in my eyeballs. That kind of set up how the rest of the evening went, blissfully magical and incredibly serene. It's so hard to stay present and not get caught up in the hustle and bustle, especially living here in New York. Everything is happening at a trillion miles an hour. I love Yoga because the breath forces me to be present. As the sun was setting and we were moving through all the different postures and movements I couldn't help but notice all the tension I was holding. Every time one of the wonderful assistants would give me an adjustment, my entire body would release which is a bit of a sobering feeling. The problem is, I'm normally a present person. Theater school made me that way because as an artist you are taught to receive what is going on around you and then craft an honest response. So I've developed strong listening and receiving muscles. But when I get really busy and I spread myself to thin, I tend to put my head down and start trying to get through the days. I stop listening to myself and everything around me and I step away from being present. And when I do that I get overwhelmed and I sort of shut down. It's a terrible feeling, sort of like I'm taking really shallow breaths instead of really deep ones. That's kind of how the last month has been and I really needed to stop and reflect. This is my "Oh my god I can't believe this is happening." Face. Front row for Ingrid. My heart is still bursting. There's not much I can do when things get crazy except remember to take a moment to stop, breath, listen and smile. But it does help to put yourself in a park with 10,000 people and then have Ingrid Michaelson sing to you. No I'm kidding (but that did help-If anyone can throw a case of the feels on you it's Ingrid Michaelson. I'm not even going to start with my history with her but she's my favorite artist ever.) One saying that's really resonated with me over the years is hold on tightly, let go lightly. So I'm going to continue doing that. Until next time, #RunSelfieRepeat.